As you all know, I'm an agent with BzzAgent and I take part in marketing campaigns. I get to try new products and services, tell you about it, and then share your feedback with BzzAgent who then passes the info along to the company we're campaigning for. 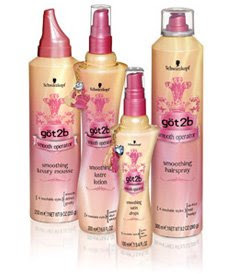 I just received my Bzz Kit for the göt2b smooth operator smoothing lustre lotion. It was by far the most fun kit to open! It was filled with pink tissue paper and 4 bottles of the lustre lotion, plus a book of coupons to share with you! This luxurious little package is a weightless serum that smoothes the hair cuticle to de-frizz, tame and silken thicker hair. Contains a UV protectant. This indulgent finishing spray smoothes fly-aways and frizzies and keeps your style in place while providing an oh-so-touchable finish that's full of movement. New for 2009! Soft as a cloud, this decadent non-greasy mousse smoothes and controls, wrapping your hair like a cashmere sweater for long-lasting glamorous locks. you getting some sun today? should be 70 by this weekend here..
Where did you come across me? Think I will be reading yours every now and then. bwahahahahaha you have just set the standard to what my day should be like....FULL OF LAUGHTERRRRRR! !